When San Francisco-based designer Jennifer Bennett wrote a blog post about the fashions on TV's Gossip Girl, she didn't expect her product line to end up starring in several episodes. 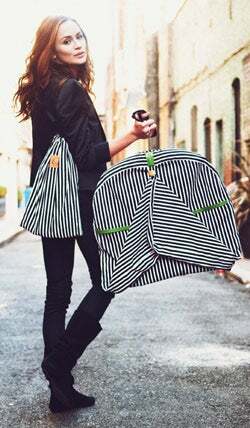 But in a case of extremely good timing, the show's prop master was searching online for "stylish garment bags" like those created by Bennett, and happened upon the designer's blog. Eventually she approached Bennett about featuring her eco-friendly Jendarling bags on the show. After Gossip Girl actress Blake Lively carried a Jendarling creation on an episode that aired in May, online sales rose by roughly 30 percent, and visits to the bag company's website jumped from 1,000 a month to 13,000. Since then, Bennett has been invited to deliver more samples, some of which she designed exclusively for the show. "Since the show, there's a lot of interest in custom orders that match Lively's bag," she says. While the emergence of Bennett's business owes a great deal to luck (and the power of online search), the success of another entrepreneur, Matthew Griffin, whose six-year-old company makes baking pans, proves that targeted marketing and persistence make for a powerful combo on the endorsement front. "Our goal is to try to get celebrities excited about our products without having to pay them endorsement fees," says Griffin, president of Carmel, Ind.-based Baker's Edge. Griffin had none other than Oprah Winfrey in mind from the moment he conceptualized his Edge Brownie Pan. "We sent pans to the show and mentioned to her chef that we knew Oprah liked corn bread and brownies," he says. He also repeatedly e-mailed Winfrey's producer. This led to the pans being featured in 2010 on what was then TV's most coveted product slot: Oprah's "Favorite Things" episode. "Oprah spent five minutes talking about the pan," Griffin says. Winfrey's golden touch cooked up serious sales for Griffin's company. "We [neared] $2 million in sales during the Oprah year," he says. Like Griffin, you should be prepared to give away numerous samples of your product as you try to secure celebrity endorsement. One tactic: Mail items directly to celebrities or their talent agents and see what sticks. Kael Robinson sent 1,000 of her Brazilets wish bracelets, packaged in white boxes with paperwhite flower bulbs, to agents in Los Angeles and New York City in the hope that they would end up on celebrity wrists. "My friends and I packed the gift boxes in my house," she says. "Inside we put a note that said, 'We hope all your wishes come true in 2009.' I also mentioned that we donate a portion of our proceeds to a nonprofit that plants trees in Brazil. My hope was that if the agents saw that this was a good cause, that would have a positive influence on the celebrity." The plan worked. Shortly after the mailing, A-listers including Jennifer Aniston, Kristen Stewart and Anne Hathaway were photographed wearing the Brazilet, and Us Weekly published a shot of MTV reality-show star Lauren Conrad wearing one. The following month, the company experienced a 70 to 80 percent jump in sales. "We made $35,000 in a month," Robinson recalls. One warning, however: Courting celebrities can, at times, have a downside. Martha Stewart "had our product on her show and said something about it being weird-looking," Griffin says of his brownie pans. "She wrinkled up her nose and said she didn't like it. Celebs carry a lot of weight, and you can't control what they say or do."